Mamata Banerjee Calls PM Modi "Hitler's Uncle"
The TMC chief said that if BJP is voted to power again, the party might change the constitution entirely. The new drama of Modi Sena is pathetic, says Mamata Banerjee. 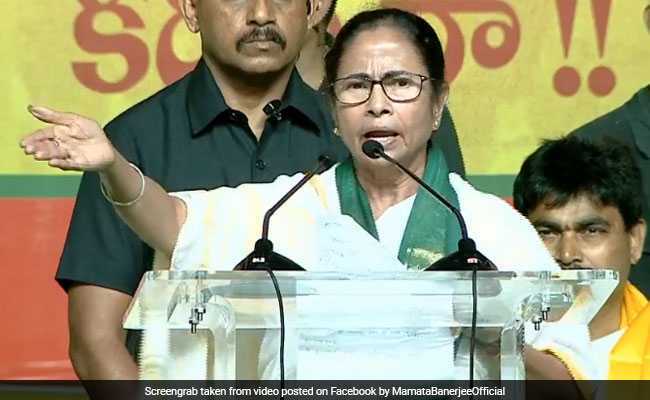 Intensifying attack on Prime Minister Narendra Modi in the wake of upcoming Lok Sabha polls, Bengal Chief Minister and Trinamool Congress chief Mamta Banerjee on Thursday termed the PM as "Hitler's uncle". "He is the uncle of Hitler," the Chief Minister said while addressing an election rally in Cooch Behar in Bengal. "If he comes to power again, there will not be elections any more. The new drama of Modi Sena is pathetic. In fact, if he comes to power (again), they might change the overall constitution. They have already changed it so much," she said said and emphasized that media is scared of the Prime Minister. Accusing the Prime Minister of changing his "identities" too frequently, she said, "(Prime Minister) Modi Babu doesn't have tea or kettle anymore, not even sugar or jaggery. Now, he claims to be a "chowkidar"." "God knows why and how he became the Prime Minister? Is money the answer? This self-claimed "chowkidar" has reached his expiry date," the Chief Minister added. Questioning the "need" for a biopic on PM Modi, she said, "Why will people watch your film? If people want to watch films they will watch films on Gandhiji, Ambedkar ji, why Modi? What contribution he (PM Modi) has made to India?" Referring to the Prime Minister as "expiry Babu", the Chief Minister claimed that around two crore jobs were lost during the tenure of Narendra Modi-led BJP government. She also termed the attempt to amend the Citizenship Act as "conspiracy". Lok Sabha polls in Bengal will be held in all the seven phases from April 11 to May 19. Counting of votes will take place on May 23.